The earliest known case of cancer has been identified in the skeleton of a Siberian Bronze Age man. The 4,500-year-old bones have significant marks and holes, alerting researchers to the devastating lung or prostate cancer that the ancient man had endured. This new evidence of the illness in ancient bones demonstrates that cancer is not only a modern phenomenon, but also affected the ancient world. The Baikal-Kokkaido Archaeological Project and research team which located the rare find was comprised of international experts, including bioarchaeologist Angela Lieverse of the University of Saskatchewan in Canada, archaeologist Vladimir Bazaliiskii of Irkutsk State University in Russia, and biological anthropologist Daniel Temple, of George Mason University in the U.S., reports The Siberian Times . “This is one of — if not the oldest — absolute cases of cancer that we can be really, really confident saying that it's cancer," Angela Lieverse told CBCNews. Previous cases of cancer have been detected in remains up to 6,000 years old, but those remained unconfirmed or with tumors that were benign. 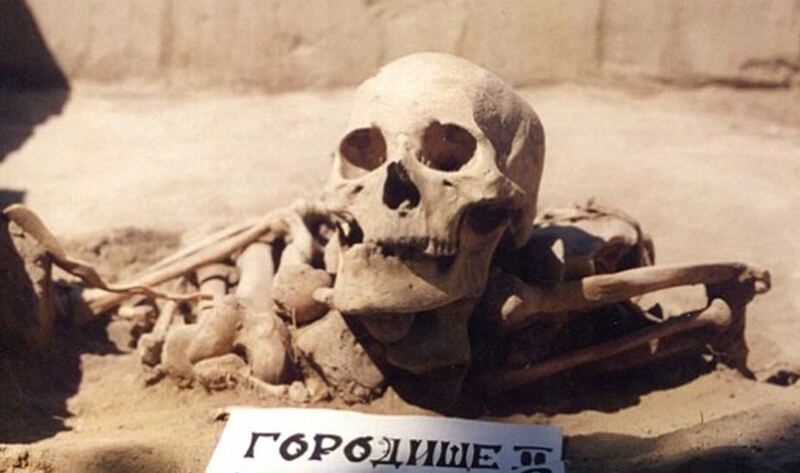 The remains of the man, dating from the Early Bronze Age, show he was 35 to 45 years of age at the time of his death. He had suffered from a cancer which spread throughout his body, the deterioration of his bones leaving him immobile. It was almost certain that those around him would have recognized he was ill. They had placed him in a circular grave in the fetal position, his knees drawn up into his chest, and he was buried with a crooked bone serpent spoon, among other items. According to CBCNews this type of burial is in contrast to other men at the time who were buried on their backs with fishing or hunting gear. Temple also touched upon the importance of the find, saying that diagnosing a case of cancer from 4,500 years ago is relevant to how modern cancers are viewed. Environmental causes and industrial contaminants are often blamed as the cause of modern cancers, and while this find does not challenge that link, the current understanding of cancer can be expanded with this additional information, according to George Mason University News. Perhaps his pain was mitigated by those around him. There is evidence which suggests that pain management in ancient times was accomplished through the use of natural techniques, such as herbs, or cannabis. The 2,500-year-old mummy of a woman found in 1993 in a kurgan (mound) of the Pazyryk culture in the Republic of Altai, Russia, was buried with a pouch of cannabis , commonly known as marijuana. Found by her body, the Princess of Ukok may have used it to cope with the symptoms of her illness. Researchers revealed that the young woman died from breast cancer, and suffered numerous other ailments. The Baikal-Kokkaido Archeological Project team discovered the Bronze Age man’s bones while examining remains in a small hunter-gatherer cemetery in the Cis-Baikal region of Siberia. The study detailing the rare find has been published in the scientific journal PLOS One . The crooked serpent spoon is the best part of this article. Such symbolism. Ancient thoughts of afterlife were much more hopeful. That is absolutely incredible that there is evidence to support the idea that cannabis was used to treat cancer back then as well. Excellent article.